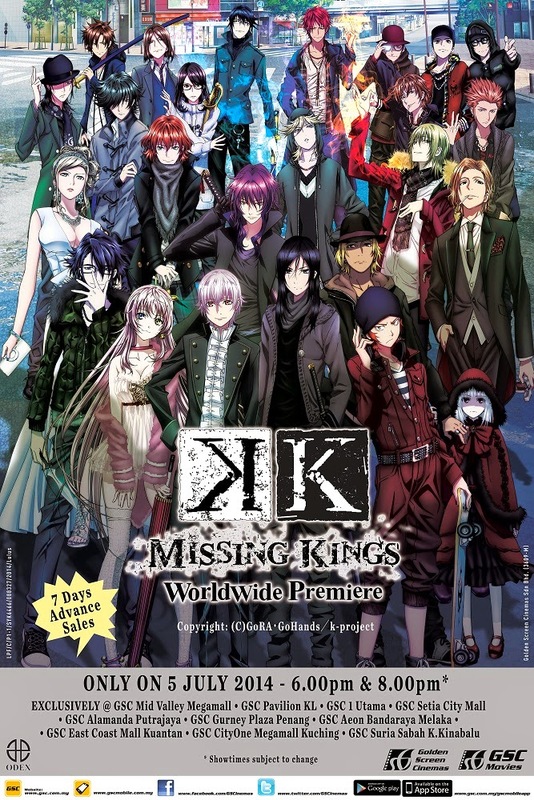 Malaysia joins USA, France, Taiwan and Singapore in this One-Day World Premiere of K Missing Kings, a feature film of the anime series K. Apparently very popular, but I guess I’m little outdated. The anime movie will be shown exclusively over the GSC circuit in 10 selected cinema locations on 5 July 2014 – one day only. There will be 2 shows (tentatively 6:00 pm and 8:00 pm) held in each location and advance ticket sales will commence from 27 June 2014, 12pm onwards. Fans can also stand a chance to win 10 signed T-shirts by key voice-over talent by participating in a GSC website contest that has already started since 19 June. For more details, log on to www.gsc.com.my.